Speakers from: World Wide Creative, Techstars, Sw7, Parcelninja, Discovery Health, PayFast, Microsoft, Junk Mail, Opera, Datawind, Gumtree, SA Florist, Nic Harry, Barclays, Memeburn and Thoughtworks. Covering disruption, eCommerce, IoT / Makers, Leadership, Marketing, Mobile, The Next Billion, Social, Startups, Tech, UX & Women in Tech. This year we have 12 tracks, 4 event days, with 79 excellent speakers in 70 sessions. Tech4Africa is the largest tech innovation, startup and entrepreneur platform in Africa. We congregate the African tech industry. Expect to meet: marketeers, entrepreneurs, technologists, opinion leaders, business strategists, start­‐ups, educators, corporates, journalists, tweeters, bloggers, developers, VC’s and more. So there is plenty of opportunity for meeting new people. On the two days prior to Tech4Africa there will be a Random Hack of Kindness, and the day after Tech4Africa, we’re putting on a Startup Day By Entrepreneurs, for Entrepreneurs. We’re now in the iconic FNB Stadium, and we love it! We are going to race drones in the FNB Stadium! Lots of networking opportunities before, during and after. Did we mention lots of FREE coffee? Over R25k of prizes, lots of tech schwag to take home! Don’t miss out. Get your tickets now. No need to worry about finding local eateries for your breakfast and lunch. We’ll have food available at the venue. @rudshep: Really an awesome day at Tech4Africa conference. This level of energy and optimism I have not seen anywhere else. SA Tech Rocks! @liambeeton: We have come to the end of @Tech4Africa #T4A. I really enjoyed myself, met some great people and am taking so much info away. There are opportunities which are being missed by focusing on the wrong problems. There are lack of skills around Shipping Product. There are also skills gaps around determining the business case of projects / problems etc. There are of course exceptions to this, thankfully (! ), but by and large we’re thinking that by focusing on workplace relevant skills, and problems which can product viable businesses, a Hackathon could have more long term value to the people who participate. We don’t think that it’s our place to take sides on specific Technologies, and we don’t really want to replicate what other people are already doing. We’ve spent a lot of time thinking about what the opportunities are in Africa right now, and what’s clear is that it’s not going to play out the same way it has in the “developed” world until now. The reason is that when you look at the building blocks of the internet, there are clear un-met challenges which make those opportunities both different and harder. whilst the rest of the “developed” world is focusing on top of the pyramid problems around self-actualisation, creativity, problem solving, authenticity and spontaneity (as memes for products), the African market still has pretty much all the layers of the pyramid left as opportunities, with the bottom of the pyramid still largely untapped. When you dissect the opportunities at the bottom of the pyramid, you’ll find that they are primarily “utility” problems which exist in the lives of people everywhere, every day, in all markets. 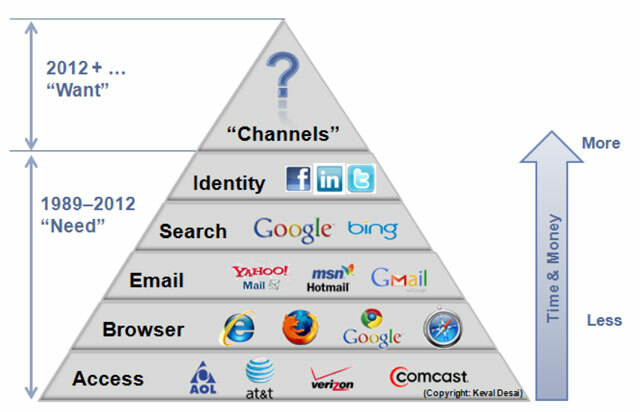 For example: most diagrams will show “internet” or “wifi” as the base of the pyramid, and as such is probably the biggest opportunity (which is why the Telcos are so dominant in people’s lives). 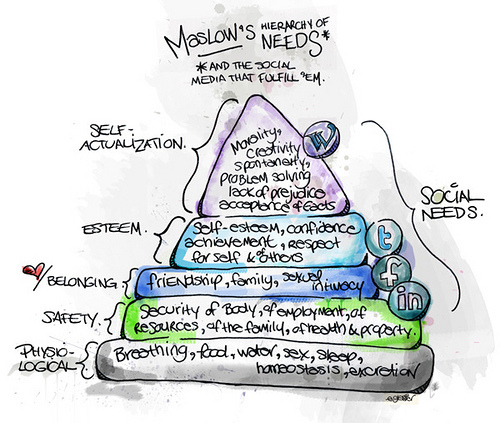 Maslow in the Internet Age. Want to build big tech product for Africa? Focus on product with daily value for user. This is the utility & viability part. Mobile first. This is the market demographic & adoption part. Make it easy to share. This is the common sense part. Make sure cash-flow has you in it. This is the “Don’t waste your time” part. Family: Where are my family? Are they safe? So we’re not going to be encouraging an “Uber / Facebook / LinkedIn / Buzzfeed / Slack etc for Africa” – what’s the point? We’re going to give clear direction on a product that could become a business. The RHOK will focus on problems which occur in everyday life (this is where the business value is). It will solve something which will mean people will talk about it (because it has given them value). There will be a reasonable vision of adding transactions for cash flow, although this won’t be the focus for the RHOK itself. Everyone will work together as a team. The development focus will be on executing for mobile devices. We WILL ship an MVP product in 2 days. All skills learnt over the two days will transfer to the workplace. Cloud servers on Azure – The machines will be small but adequate, and limited to the Hackathons. Cloud training help, eg: how to build machines running Linux/Win/MySQL,IoT, etc on Azure. Free online training via Microsoft Virtual Academy. Small Azure instances to attendees who participate in the RHOK. We’re really excited by what this will produce, and we’re looking forward to rolling this out across all of the cities we go to. See you there! Email sent to delegates today, applies to everyone at all Tech4Africa events! Just a quick note to remind you of a few things for Tech4Africa. ​, and it’s easier to walk & write​! ​Sit next to people you don’t know, introduce yourself, say hello! Make sure you arrive at least 30 mins before, and that your presentation is ready to go. There will be music between sessions, so we’re not waiting for anyone if they run late in their session. If you do all of that, it will be awesome!! Don’t make the assumption the audience is dumb. Ever. Do make the time spent worthwhile. The best content is a story, a case study or a learning. The best speakers speak from the heart and through experience, not from a practiced powerpoint. The best content is 20 to 30 mins long, is uncomplicated, has 3 core messages, and has slides with one single point on each, and no more than 10 slides. The best speakers have the audience on the edge of their seat, or in the palm of their hands, in the first 5 mins. Do respect the audience, do respect the time they give to listen. Be honest, be open, be curious, be humble and most of all make sure the audience walk away just a little richer for the time they gave you. Don’t do corporate bullsh!t. People see through it immediately. Don’t do sales pitches. Everyone has heard them, they are boring. The audience is there to learn something, not pay R500 to get sold to. Don’t do Death by Powerpoint. Don’t have a speaker who can’t answer questions. People see right through suits & ties at an event where people are learning. A tie doesn’t infer seniority. Hopefully you’re not wearing a tie right now. These are all simple things, but believe me I’ve seen an audience of 6k people turn on Mark Zuckerberg in 15 mins when being interviewed by Sarah Lacy (http://www.wired.com/2008/03/sxsw-mark-zucke/) and it was a train wreck. Put a big brand on the stage with poor content, and the audience will turn and tweet about it mercilessly. Put a big brand on stage, and give the audience something they can chew on, and they will sing their praises all day. PayPal did it well last year. XXXXX sent in a sales guy, and the auditorium emptied in 20 mins because he pulled out a powerpoint and told an audience full of tech people that XXXXXXXXXXX…. ^^ above to protect the reputations of people who should know better.